When Renee Holden saw the large lump under her cat’s tongue, her instincts told her it wasn’t good. She just knew that her 13-year-old calico Ginger had cancer. The prognosis wasn’t any better. Ginger was diagnosed with squamous cell carcinoma, an aggressive cancer that is common in older cats. The disease “has this insidious onset,” says Elizabeth McNiel, a veterinary oncologist at Cummings School’s Foster Hospital for Small Animals. “Nobody really knows it’s there until it’s very advanced.” Because Ginger had late-stage cancer, surgery was not an option. And chemotherapy and radiation therapy would do little to extend her life. 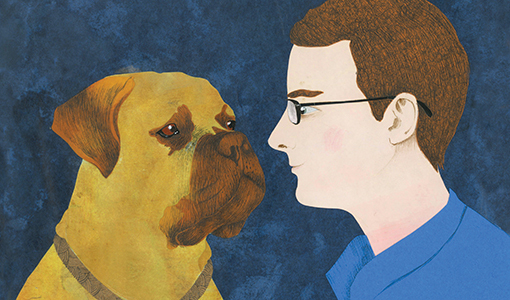 In the brief time they had left together, Holden and Ginger were able to do something to advance our understanding of cancer in both people and animals. Through the Tufts Human-Animal Cancer Collaborative, a partnership among oncology researchers, veterinarians and physicians, Ginger received an experimental drug for treating squamous cell carcinoma. McNiel and two colleagues from the National Institutes of Health are running the drug trial to determine whether an engineered protein, based on toxins produced by the anthrax bacteria, can target and kill oral tumor cells such as those causing Ginger’s disease. The drug, called intercomplementing toxin (ICT), has shown promise in mice. Ginger and other companion animals are on the frontline of a field known as comparative oncology, which evaluates how cancer behaves and is best treated in people and other species. Tufts is one of just 20 U.S. academic institutions that are part of the National Cancer Institute’s Comparative Oncology Trials Consortium, which designs and conducts clinical trials of new ways to treat cancer. “Tufts University is very unique in that we have a well-established, strong cancer center at the medical school and Tufts Medical Center in Boston and a very strong cancer center at the veterinary school in Grafton,” says Andrew Evens, a professor at the medical school, director of the Tufts Cancer Center and chief of the division of hematology/oncology at Tufts Medical Center. That nucleus of expertise in human and animal medicine could help streamline the federal drug-approval process. Less than 5 percent of new treatments for cancer and other diseases receive Food and Drug Administration approval for use in human medicine, McNiel says. Comparative oncology researchers say this is because methods for evaluating new treatments rely too heavily on testing in lab animals in which cancer has been artificially induced. “We are testing the drugs in mice that have been genetically modified, exposed to chemicals that promote the growth of certain cancers or injected with tumor cells,” McNiel says. At Tufts, researchers and clinicians are studying diseases that occur naturally in pets, just as they do in people. Because people and their pets share the same environment, and therefore are susceptible to the same factors that cause cancer and other diseases, companion animals are more predictive of the progression and treatment of disease in humans. “This model is a lot closer to the way cancer occurs in real life,” says Kristine Burgess, V97, a veterinary oncologist at the Foster Hospital. McAllister, who studies the role that neighboring normal tissues and cells play in metastatic breast cancer, sought to work with Burgess for just that reason. Unlike lab rodents, some dogs naturally develop mammary carcinoma, which behaves like breast cancer in people. With consent from clients whose pets were undergoing treatment for mammary tumors at the Foster Hospital, Burgess provided McAllister with surplus biopsy tissue. These animal tissues may help oncologists determine why some women’s cancer returns or spreads despite aggressive treatment, while other women are cured. “If you look under the microscope at a mammary tumor formed in a dog or a breast cancer formed in a human, in many cases they look identical,” McAllister says. The normal cells and tissues surrounding tumor cells in dogs are also significantly more akin to those seen in humans than in mice, she notes. For Cummings School patients, the Tufts Human-Animal Cancer Collaborative promotes more robust research aimed at fighting life-threatening cancers. McNiel spends 75 percent of her time with the 17 cancer researchers at the Molecular Oncology Research Institute at Tufts Medical Center in Boston and the rest of her time treating animals at Cummings School of Veterinary Medicine, 40 miles west in North Grafton. As a bridge between human and animal medicine, McNiel has been able to connect Foster Hospital clinicians with their counterparts in human medicine. “We tend to form our alliances around particular cancer types,” says Phil Hinds, professor and chair of developmental, molecular and chemical biology at Tufts School of Medicine. His lab is working with McNiel to investigate how genes and proteins may fuel the development of osteosarcoma, an aggressive and difficult-to-treat bone cancer in children that also occurs in large-breed dogs. With support from the Morris Animal Foundation and a Tufts fund that encourages collaboration across disciplines, Tsichlis, the Jane F. Desforges Professor at Tufts School of Medicine, and McNiel are investigating how genes in people and pets trigger normal cells to become malignant. The researchers believe NDY1 may play a similar role in bladder cancer. The protein is found in greater concentrations in highly invasive bladder cancers—which account for most bladder cancer in dogs—than in the more superficial bladder cancers seen in the vast majority of human patients. Comparative oncology research is changing that. Take Tanovea, a drug developed to treat lymphoma, one of the most common cancers in dogs, and non-Hodgkin’s lymphoma, the comparable cancer of the lymph nodes in humans. “Initially, a pharmaceutical company was looking at a lymphoma drug that would be given to humans or dogs,” says Burgess, the veterinary oncologist who is working with Evens, director of the Hematology and Oncology Program at Tufts Medical Center, to study the disease. Humans and dogs both received Tanovea during a clinical trial conducted at multiple institutions, she says, “and it turned out to be a very effective therapy in the dogs.” Tanovea will likely become the third oncology drug to receive FDA approval for exclusive use in dogs. George, a 6-year-old bull mastiff, participated in the Tanovea trial at the Foster Hospital. Although the disease has come back a few times since he was first diagnosed 20 months ago, he’s currently in remission. The average life expectancy for a dog with lymphoma is around 12 months. Such was the case for Ginger, the cat whose oral cancer was treated with the experimental anthrax-based drug. Over the two weeks of the small preliminary study, veterinarians injected the drug directly into the tumors of Ginger and two other cats. “They did find a small amount of shrinkage, which I was very excited about,” says her owner, Renee Holden. The cancer eventually got worse, and Holden made the difficult decision to euthanize her beloved companion on New Year’s Day 2014—eight weeks after she first underwent treatment. When it comes to preventing or fighting cancer, a quick Internet search would lead you to believe that what you eat is the answer. What is known, he says, is that undernourished cancer patients don’t respond as well to chemotherapy and other treatments, and they are more susceptible to infection. Conversely, for the many cancer patients who become overweight because of lifestyle changes related to their diagnosis or side effects of chemotherapy, maintaining a healthy body weight and keeping active also can improve cancer-treatment outcomes. Pets with cancer often gain weight because of “sympathy treats,” says Cailin Heinze, an assistant professor of nutrition at Cummings School. More than those indulgences, though, Heinze worries about owners who are misled by bad nutrition advice they find online, including recommendations to feed raw diets to pets with cancer. These diets can be dangerous for an animal whose immune system has been compromised by chemotherapy or the cancer itself, she says, because raw food is frequently contaminated with bacteria, such as salmonella, E. coli and listeria. Just as troubling is a 2012 Cummings School study that analyzed homemade-diet recipes claiming to provide benefits for dogs with cancer. The veterinarians found that none of them met the nutritional requirements for an over-the-counter diet for a healthy dog. “That’s bad news for a pet with cancer,” Heinze says, “because you minimally want to meet all the nutritional needs that a healthy pet has.” The research was published in the Journal of the American Veterinary Medical Association in 2012.